This golf course was designed by Jose Gancedo who was also the designer of La Finca and you can see many of his ‘trademark’ features on this course including the variation in green size and shape and the additional 19th hole. 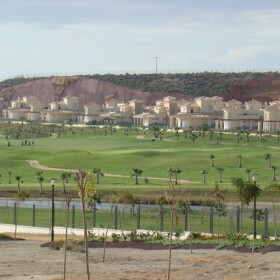 The main feature of this golf course is the ‘Ramblas’ (dry river bed) which winds its way through the centre of the course. The course opens with a down hill par 4 hole of 381 metres which plays longer than you think and you must trust the distance markers on this course or you will continually be short. 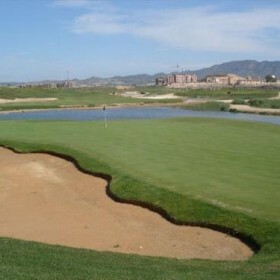 The third hole is an absolute ‘brute’ at 535 metres (588 yards) particularly if played into the wind. The 5th hole looks like a good birdie opportunity on the card but wait until you get to the green which only six metres wide and 50 metres long and undulating along its entire length. 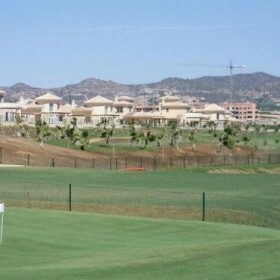 This is a new golf course and there are parts of the surrounding banks and hills which need time to mature and for the grass to grow but the tees and fairways are in a good condition and the greens in particular are some of the best in Murcia and this course is well worth playing for golfers of any standard.